◗ Guest curator B. Byron Price, director of the Charles M. Russell Center for the Study of Art of the American West at the University of Oklahoma and director of the University of Oklahoma Press, has been riding herd on what stories to tell with which objects. ◗ Exhibition designer Caroline Lajoie is project-managing the exhibit, which entails overseeing a detail-rich exhibition book containing all the artifacts, their label and owner info, status of the loans and more. ◗ Museum Director Frances Levine has traveled the state in search of support as well as artifacts that can help tell the story. Because of the economic forces squeezing out New Mexico ranchers, she often finds herself chasing those artifacts just before they’re sold for scrap. ◗ Levine and Marketing Manager Kate Nelson have toiled over rewrites and factchecks of Price’s script and publicity materials, getting familiar enough with the Chicago Manual of Style to resent its sometimes convoluted rules (and ignoring the constraints when they simply can’t “take the bit”). development and even loaned some photos and artifacts. Baca and Nelson will next turn their eyes toward the look and sound of ads to promote the exhibit. ◗ Lending free-lance support to Price, Levine, and Lajoie is former History Museum curator Louise Stiver, who’s also working on the front-window exhibit, a recreation of saddle maker Clint Mortenson’s shop near Santa Fe. ◗ Tom Leech and James Bourland at the Palace Press are midway through a long-awaited fine-press reprint of Jack Thorp’s Songs of the Cowboys with new illustrations by cowboy artist Ron Kil. ◗ Librarian Patricia Hewitt stepped up to fill departed Registrar Wanda Edwards’ shoes by wrangling our artifacts and the exhibit’s many loans, everything from fine art to a rusty horse trailer. 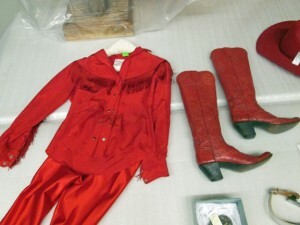 Pennie McBride and Patrick Cruz, along with their volunteers in the collections vault, have pulled objects from storage, accepted loans, and ensured everything’s accounted for and in good condition, including legendary cowgirl Fern Sawyer’s almost-as-legendary red outfit (at left). ◗ Photo Archivist Daniel Kosharek has tamed a multitude of rare photographic images into the still-considerable total that will carry visitors through the exhibit. He and Mark Scharen are now prepping the images for display. ◗ Rene Harris has developed educational curricula, hands-on interactives, family activities in the Gathering Space, and a secondary exhibition text aimed at children and told by a cartoon cowpony named Popcorn. 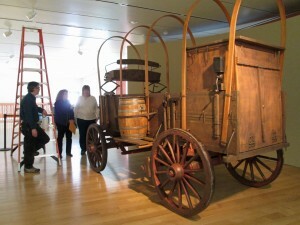 ◗ Preparator Doug Jewell has repaired a problematic light track in the exhibition space and, along with staff across the street at Exhibits Central, is building mounts and other pieces of the exhibition set, including the restored chuck wagon seen above. 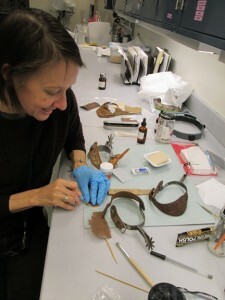 ◗ Museum Resources Division Conservator Mina Thompson (at left) is buffing up silver spurs, windmill arms, and other artifacts. ◗ Nearly everyone on staff helped plan the exhibition’s programming, including a Wild West Weekend in August, lectures, a performance by cowboy musician Don Edwards, and a series of classic western-movie nights with critics and authors organized by librarian Tomas Jaehn. Like a cattle roundup, the process can look a little messy and, sometimes, a little scary.